Take taekwondo beyond just kicking and punching—discover powerful grappling moves that build on the patterns you already know! Taekwondo is the most popular Korean martial art, with over 70 million practitioners in the world. 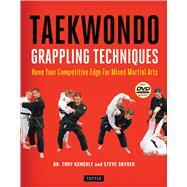 Taekwondo Grappling Techniques presents the most effective grappling maneuvers ever developed for taekwondo. With this comprehensive taekwondo book as your guide, you'll confidently defend yourself against attacks and apply your own devastating grappling techniques to bring assailants into submission.